All was changed - but who are those "vivid faces" in Yeats' Easter 1916? With Wes Welker leaving Tom Brady for Peyton Manning, the New England Patriots appear to be trying to rectify Brady's loss by bringing in one of Manning's long-time teammates from his days with the Indianapolis Colts. For a long time, while Peyton Manning was leading the Colts' offense, Dwight Freeney was the superstar on the defensive side of the ball in Indianapolis. Freeney is one of three players visiting Foxboro today. Not only does the veteran defensive end have a track record that fits an important need for the Patriots' defense, but he also will likely come at a cost affordable price considering his age. 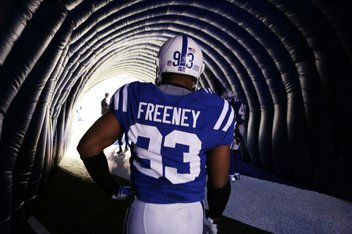 Freeney just turned 33 years of age and has been in the NFL for 11 years. Last season he registered just five sacks, but he was playing out of position on a defense that gave him little to no support. The Colts' secondary was one of the least talented in the league last season. Couple that with a position change and revamped front and there wasn't really the pass rushing opportunities that Freeney desired last year. Because the Patriots expect to have a healthy Chandler Jones back and an improved secondary this coming season, Freeney would find himself in a much better situation should he sign on in New England. In fact, that situation could be made even more appealing if the team signs one/or both of the other two veterans visiting on Friday. Former Arizona Cardinals' strong safety Adrian Wilson and former Atlanta Falcons' defensive end John Abraham are unsurprisingly in Foxboro today. Wilson is a hard-hitting defensive back who can intimidate receivers going across the middle, provide excellent run support and run with tight ends and wide receivers. The only knock on Wilson is his age. He will be 34 by the end of next season, but that shouldn't put off the Patriots. If Wilson can aid their championship chances for just one season, then he will be worth signing because Tavon Wilson is in place for the long-term. With Abraham, it may be a case of one or the other between he and Freeney. If that is the case, Abraham would likely be the better option. Abraham will be 35 this year, but he's been very consistent in producing for the Falcons over the last two seasons. It has to come to an end at some point, but there have been no indications that he won't be able to play to a high-level this season. Depending on each player's motivations, the Patriots could ultimately sign all three players to install some production and experience into their defensive unit. None of the trio are still game-changing individuals at this point in their careers, but in various roles for the team they could combine into a difference-maker for the defense as a whole. If they are forced to prioritize pieces, then the two pass-rushers will definitely be who the Patriots want to keep around for a contract signing.